Canadian thrash/ heavy metal band Annihilator have had more than 30 different members since forming in 1984 but now only one man from the original line-up remains. That guy is Jeff Waters who could almost be considered a one man band as on Annihilator's forthcoming 15th studio album, Suicide Society, he handles all songwriting duties, plays all guitar and bass and is lead vocalist, as well as engineering, producing, mixing and mastering the record. But he won't be alone on stage when the band visits the UK for a short tour, starting at Birmingham's O2 Academy on September 30. He'll be joined by drummer Mike Harshaw, bassist Cam Dixon, who was previously a member in 1994 and 1995, and guitarist Aaron Homma. 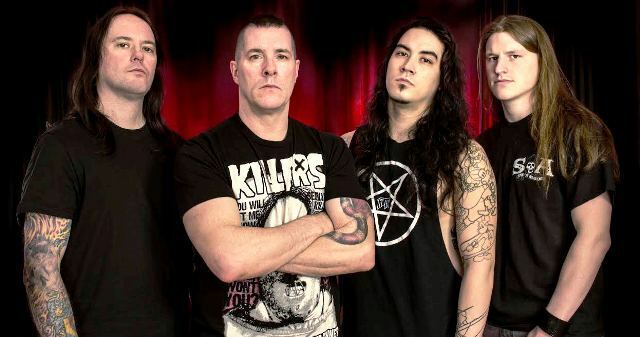 Formed in Ottawa by Jeff Waters and singer John Bates, Annihilator has had a bewildering number of vocalists, drummers and rhythm guitarists over the past 31 years. Waters has taken over as lead vocalist twice before, in 1985/6 and 1994/7 when he released the critically acclaimed albums King of the Kill (1994), Refresh the Demon (1996) and Remains (1997). Dave Padden fronted the band between 2003 and 2014. Jeff explains: "Dave and I have, essentially, been Annihilator since 2003 but he resigned last December, citing having had enough of touring, being away from home and other commitments. I thank him for his 11 years with Annihilator. ''That said, Annihilator and I are known for never giving up and, occasionally, coming up with something even better than its former offerings. This is undeniably the case with Suicide Society! Oct 4: O2 Academy Islington, London.